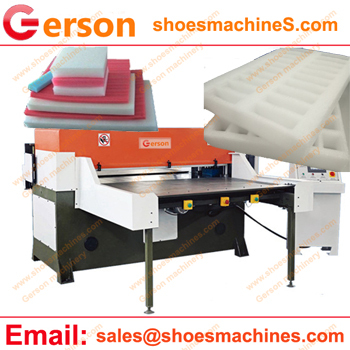 1.The epe foam die cutting machine can die cut out the material any shapes by the cutting die or mold which can be customized by Gerson mahcinery. 2.The epe foam sheet die cutitng mahcine can feed material by manual or autoamtic feed .All depending on your production request. 3.The epe foam die cutitng machine have the structure of automatic balanced four-column rod, ensuring the same multi-layer cutting and automatic cutting of slow-speed system. The central lubricating system ensures its precision and durable. 4.The epe foam die cutting machine can be feed in sheet material .Also can be for roll material if you have roll material for die cutting .We have roll autoamtic feeder fory our material. 5.All custom build machinery ,please contact Gerson for more information. EPE foams are low density, semi-rigid, closed cell foam that are generally somewhere in stiffness/compliance between Expanded polystyrene and Polyurethane. Packaging: TV computers/monitors, refrigerators, washing machines, electronic equipments, glassware, ceramics, polyester yarn/films, handicrafts, printers, UPS, currency teller machines, diagnostic kits, and surgical equipments and other fragile and delicate products. Electronic equipments:As corner pads, buffers, encapsulation blocks, ribs, and support pads, adhesive backed sheets etc. Automobiles:Roof tops, engines, bonnets and drivers cabin insulations, door panels and seat linings, floor mats, carpet underlays, upholsteries, sun visors and car AC insulations etc. Construction:Expansion joint fillers, water proofing of terraces / roofs, foundation wraps, sound barrier underlays, false ceilings, structural glazing. Miscellaneous:Carpet underlays, shoes, foam floaters for effluent treatment plants and distilleries, luggage and leather bag linings, caps, Rakhees and jewelry boxes, leather jackets, floppy disk. Sports:Wrestling, judo, gymnastics, taekwondo, and jogging exercise mats. Leg and thigh guards, arm elbow/shoulder pads. Helmets, sleeping bags linings, ski belts, life saving jackets, glove and costume insulations.